We had a great day on the water on Thursday. With five different cruises just for Whale Watching, plus a couple of Snorkel Cruises thrown in, there’s way too much to report for one email, so I’ll just give you a few highlights. Though the surf was up today, the wind was very, very calm, allowing us to see for miles. There were lots of Humpbacks visible all day long — on our Wake up With the Whales Cruises (we took both Seasmoke and Manu Iwa out), we all saw a few breaches and lots of great fluke dives. On our Kid’s Educational Whale Watch Cruise, the kids (and parents and teachers from Wai’aha International Family School) got to see 3 spy hops about 100 yards from the boat. We also saw a pretty big peduncle throw. On our Whales and Cocktails Cruise we had several close encounters with adult Humpbacks, and when we stopped the boat we could actually hear the whales singing through the hulls. After we were serenaded for several minutes, we decided to deploy the hydrophone and our close-by singer was certainly the star of the show. He was making some groaning, clicking, and squealing sounds that were new to us (along with the “whooop, whoop, whoooooop” sounds we were familiar with from last year. The best part was when the singing stopped briefly. We knew he was on the way up, and he surfaced just 50 yards from us! Mahalo and have a great weekend. I’ll send out a recap on Monday. Captain Claire’s Humpback Fact of the Day: Yesterday, I mentioned that researchers estimated a Humpback’s daily fish consumption during the summer season to be on the order of 2000 pounds per day. And if you do a quick Google search you’ll find that “fact” cited all over the place. Turns out that this may be just another example of how inaccurate information gets spread. Once a “fact” is listed in a book, it’s picked up on the internet and its spread can be exponential. 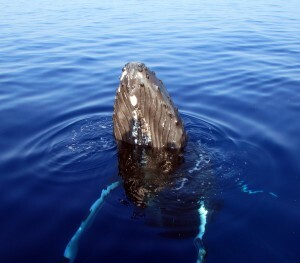 According to researcher Briana H. Witteveen and her colleagues who conducted a study to determine the effect of Humpback predation on fish abundance near Kodiak Alaska, based on the documented stomach contents of Humpbacks “processed” through whaling stations back in 1937, combined with estimates of actual suitable prey availability, an average size Humpback whale is eating more on the order of 800 pounds (or about 576,000 calories) of food each day.Does that seem like a lot of food to you? We had a Kona storm roll in to the island on Friday, so we had to cancel a bunch of our cruises…but we did get to go out a couple of times, and we got to see some pretty fun stuff. On our Friday Wake-up With the Whales, guests on Manu Iwa spent the first hour or so watching 10 different whales in pods of two just spouting and diving. We did get a few great fluke shots. But towards the end of the cruise, we were “mugged” by a sub-adult! This guy came right up to the boat, spy-hopped on the starboard side and looked at all of us. We were going crazy! Then he slid below the surface, swam underneath us and spy-hopped on the port side looking at all of us again! On Friday’s 10:00 Whale Watch on Alala we saw spouts from 14 different Humpbacks. Most were in pods of two, but we did see a few solo whales. Everyone seemed to be very relaxed, just surfacing, taking 3 or 4 breaths and diving. Most of the whales were on 15-17 minute dive cycles. By Sunday, the ocean had calmed down a little, but it was still sort of bumpy out there. On our 8:00 Wake-up with the Whales, we saw 6 different Humpbacks, mostly just breathing and diving. Same thing on our 10:00 Whale Watch — we saw 10-12 different whales and they were all just spouting and diving.But on our mid-day private Whale Watch we got to see some breaching about 75 yards from the boat. Captain Claire’s Humpback Fact of the Day: Spy hopping is one of the ways a Humpback can see what’s going on above the surface of the water. 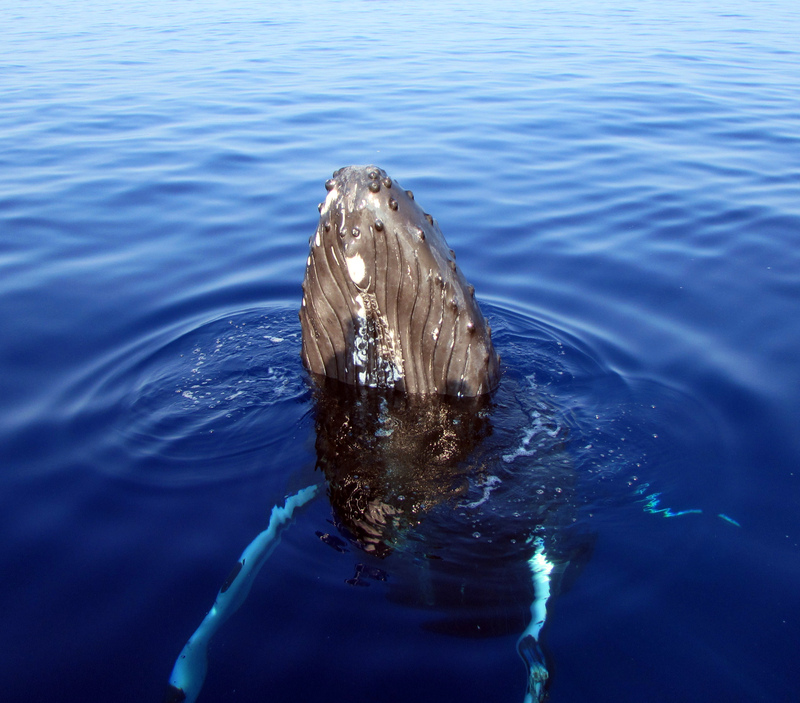 Because Humpbacks have really big heads proportionally, their eyes are about a third of the way down their bodies. When the whale spy hops, she rises slowly and vertically from the water, head first. 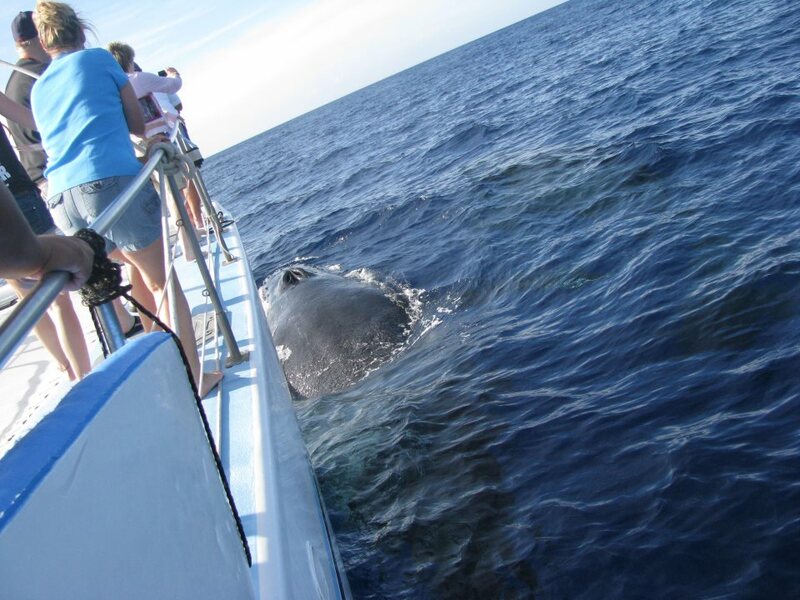 If she’s a fully grown whale, the tip of her rostrum may be 15 feet above the surface before her eyes get there! On Wednesday’s Breakfast with the Whales Cruise, we got to watch about a dozen different Humpbacks. At first we were just watching a lot of spouting and fluke dives, but when Captain Will stopped the boat, a couple of very big whales surfaced right next to us – twice! Then, we were approached by a Mom with a very small calf (the calf’s dorsal fin hadn’t straightened up yet so we know he was young). After investigating us, they turned to swim away and the little guy did a half-breach. Our 10:00 Whale Watch began with a Mom and her baby coming over to see us. Right after that, we found a small competitive pod of 3 whales. These whales were really active on the surface, giving us a good view of tail lobs, head stands, and even a double spy-hop (making us wonder if the whales were looking at us or were more interested in how they looked to each other above the surface). We finally had to break away from all the action to head back to the harbor, but on the way back in we had whales surfacing 100 yards from us all around the boat. On the Whales and Cocktails Cruise, our onboard naturalist Mike reports seeing “plenty of whales”. He also reports hearing some great sounds from the hydrophone when it was deployed. But the most interesting part of the charter happened towards the end, when we were approached by two different Mom/Calf pods. The pods were about 20 feet apart, and both of them got very active – tail lobbing repetitively, causing us to question whether they were trying to communicate something urgent to each other or to us. Did we see Humpbacks Mating? Thursday brought us some interesting whale sightings. On our Breakfast with the Whales Cruise we saw more than 20 different whales, but spent most of our time paralleling a competitive pod of 7 whales that included a Cow/Calf pair. These whales used our boat a lot (which was really exciting) diving back and forth underneath us. We also saw several breaches and tail lobs from some whales a bit further away. As if all that weren’t enough, we were accompanied by a pod of Spinner Dolphins on the way back to the bay. On our 10:00 Whale Watch we watched lots of pods of two. Most of them were just cruising at the surface heading every which way…so Captain Baker decided to head to the south. We had several close encounters with whales spouting and surfacing right behind the boat and right along side, and we got to see multiple breaches and tail lobs from different whales within about 500 yards.. After cruising along for awhile, we decided to stop the boat and drop the hydrophone. We were delighted to hear several singers (we knew a few of them pretty close by since the sounds were so loud). While we were listening, two Humpbacks started interacting with each other just about 100 yards away. One of them spy hopped several times, but what was so interesting was the way in which these two whales were interacting. The spy hopper rolled on his/her dorsal side (back) just under the surface of the water, and we could see just the tips of her curled pectoral fins. Meanwhile, the other whale appeared to be floating just on top of the first whale, They did this several times, alternating with gentle pectoral slaps and sideways fluke dives (we could see just one half of the fluke). We really wished we could have seen what was going on below the surface! Finally, on our Whales and Cocktails Cruise, we spent a lot of time watching a calf breaching over and over and over again. This little guy had energy to burn as he breached more than 20 times and threw in a few tail lobs for good measure. Captain Claire’s Humpback Fact of the Day: Though Humpbacks come to Hawaii primarily to have babies and make babies, and though researchers have watched them closely here since the early 1970’s, interestingly enough there are no documented observations of Humpbacks mating or calving! Those of us lucky enough to have been on today’s 10:00 Whale Watch left the boat wondering if what we were witnessing was Humpbacks mating!